Unmanned Aircraft Systems a/k/a UAS a/k/a drones raise unique concerns for state and local governments. These concerns fall into enforcement, operation, and regulation. Local police departments may be surprised to discover that on the Federal Aviation Administration (FAA) UAS FAQs page, in response to various possible events, the FAA directs the public to “call local law enforcement.” Given the popularity of drones and the limited resources of the FAA, it makes sense for the FAA to tap into other labor sources to investigate and enforce drone infractions. Minimal guidance is provided by the FAA in the form of a pamphlet entitled, “Law Enforcement Guidance for Suspected Unauthorized UAS Operations.” This FAA document begins by recognizing that the FAA has primary responsibility for enforcing Federal Aviation Regulations (FARs), but local law enforcement agencies are in the best position to deter, detect, investigate and “pursue enforcement actions to stop unauthorized or unsafe UAS operations.” The FAA describes this relationship as a partnership between the FAA and local law enforcement, but there is little evidence that anyone on the local level consented to this partnership. Moreover, it’s entirely possible that great numbers of law enforcement agencies are unaware of the FAA’s expectations. The legal issues are complex and numerous. Those of us entrenched in the aviation industry have had to devote significant time to keep up with the developing regulations, technology, and laws applicable to drones. It’s unlikely many patrol officers have a deep understanding of the rules and limitations imposed on drones and their operators, or that they can identify a drone that has exceeded the applicable altitude limitations, or distinguish a standard aerobatic drone flight from “reckless” and illegal operation. Still, the FAA provides some basic guidance to law enforcement. The FAA guidance explains the distinction between unregulated recreational “model aircraft” flying and commercial drone operations. The “aircraft,” pilots, and flight profiles between model aircraft flying and commercial drone operations may be identical, but if there is any commercial aspect to the flight, then it is illegal without a specific FAA permit (or waiver). Also, regardless of how any operation is classified, “careless and reckless” flights that endanger persons or property are illegal and subject to enforcement. The FAA also implies that local law enforcement may be called upon to enforce the 5-mile, drone-free perimeter to be observed around all airports. Other investigative methods also may prove useful, such as consensual examination of the UAS, equipment trailers, and documentation. However, other Law Enforcement processes such as arrest and detention or non-consensual searches almost always fall outside of the allowable methods to pursue enforcement actions of the FAA unless they are a by-product of a State criminal investigation. State and local governments have been slowly embracing drones to enhance, and in some cases, replace their traditional assets. Governments have many of the same needs that are driving commercial drone businesses: roof, tower, and bridge inspections, photo and video documentation of events, and marketing. Law enforcement adds a host of additional applications: surveillance, tracking, mapping, search and rescue, medical response, traffic monitoring, accident investigation and documentation. Of course, these lists are nowhere near exhaustive. Proponents of drones assert that each of these applications can be conducted safer, cheaper, and without the hazards that accompany manual completion of these tasks. Depending on the mission profile, governments can obtain FAA permission to operate a drone under the Part 107 rule applicable to all businesses, or they can make use of the special rules applicable to public aircraft operations under a Certificate of Authorization (COA, sometimes known as a Certificate of Waiver). In either event, a detailed application has to be submitted for the FAA’s approval, and the drones have to be registered with the FAA. The general rules under Part 107 (applicable to drones up to 55 lbs.) generally limit drone operations to 400 feet above the ground, within direct line of sight, in daylight, and separated from people, moving vehicles, and other aircraft. Part 107 also limits flight to class “G” or “unregulated” airspace which is generally not used by passenger or cargo carrying aircraft. Each of these limitations is subject to waiver, but the burden falls on the applicant to demonstrate that sufficient safeguards are in place to support the waiver. Finally, Part 107 drones must be operated by “remote pilot airmen,” granted a certificate by taking a basic aviation course (if the pilot doesn’t hold an active FAA pilot license) and passing a test. 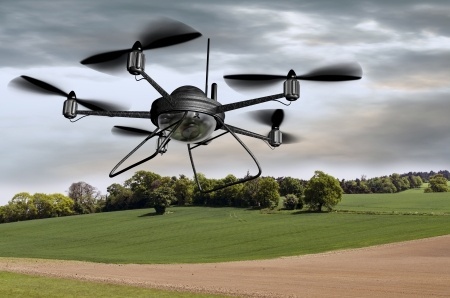 Public Aircraft Operations (PAO) including drones, are entitled to relaxed FAA oversight. In general, PAO have to be conducted in a way that is compatible with other aircraft within the National Airspace, which generally requires following the same operational rules as other aircraft. However, the FAA takes a more hands-off approach to safety and general oversight of PAO. Broadly speaking, pilot qualifications, size and capability of the drones, distance from persons and property, and maintenance of the drone can all be left to the discretion of the PAO. The mission profile of PAO is approved on a case-by-case basis without rigid adherence to set limitations. Thus bigger, heavier drones can be operated at higher altitudes, at night, beyond line of sight, and over persons and property under a COA. Regardless of whether authorization is sought under a COA or Part 107, the FAA will require a detailed submission. Detailed information about the drone, the operator(s), mission(s), as well as policy and operations manuals must be provided to the FAA. Regulation: sky’s the limit for local governments to restrict drone use? Although the federal government and the FAA have primary responsibility and authority over the national airspace, federal law leaves room for state and local governments to impose regulations that don’t interfere with FAA rules and regulations. No doubt, a local government is unable to authorize flights where they are prohibited by the FAA (such as the airspace surrounding a nuclear facility or a sporting event). Similarly, a local government can safely extend traditional privacy and criminal regulation to drones (prohibiting snooping in residential windows or armed assault via drone, for example). Hundreds of statutes and ordinances have been implemented to add additional regulation over the FAA regulations on just about every subject imaginable. Local regulation addresses pilot qualifications, privacy concerns, restrictions on use of airspace over private property, line of sight, hours of operations, and right of way. To date, there have been few legal challenges to state and local drone regulations. Unless and until we have more judicial decisions, the contours of what does and does not violate federal preemption over aviation will remain hazy. Meanwhile, anyone considering drone regulation would be well advised to obtain input from individuals familiar with the federal aviation regulations to ensure the local regulations do not create unnecessary interference with the national airspace system and/or a safety hazard to other aircraft.